Apologies for being so quiet on here the past few weeks, I have been away in Hong Kong and Malaysia for a holiday but fear not, the next few posts will have loads of photos and information on just some of the foods that I have tasted in these 2 countries. The only reason I agreed to go to HK this year was because I needed to visit my grandfather, if it wasn't for that I would have gone elsewhere because I feel like I haven't seen enough of the world yet. I am never keen on going to HK because of the rude people, the rush and the general air quality is never great. One thing that does keep me happy there though, is the cheap and varied food available. 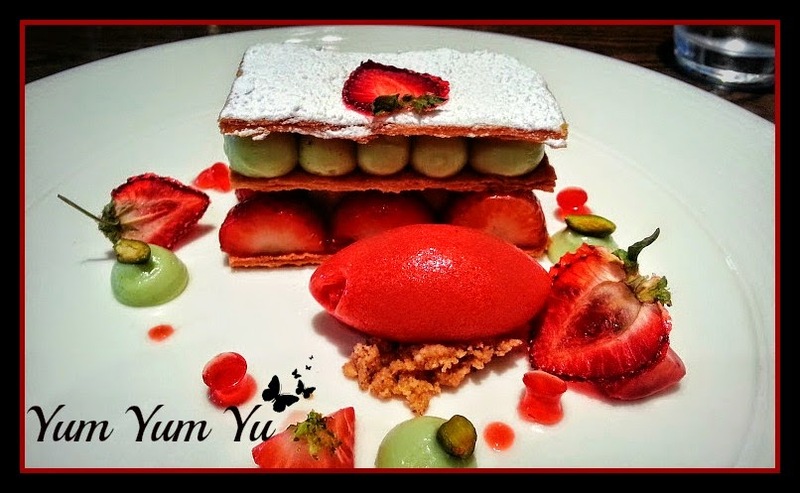 So without a further ado...here are the places/foods I tried out in HK. Note: This is not a "Guide to Hong Kong", it is just my experiences. Enjoy! This is a chain of japanese restaurants that can be found all over HK and since it was our first day, we thought we would ease ourselves in by going here. Got to be honest though, this branch in Ma On Shan is not very good. All staff, bar one had a very "cannot be bothered" attitude. Enoki muchrooms wrapped in beef: Yes, it looks dull and the flavours were very bland. I have had way better! Eel Rice: generic, nothing special. Kimchi Fried Rice that I had ordered and waited so long for that my sister in law had finished her noodles before we saw any sign of it. Cucumber salad with crab roe: this could have been a really good dish if they hadn't overloaded it with mayonnaise. We were treated for dinner here by my brother's good friend and I can't thank her enough! The food was fantastic - fresh, varied and every dish was truly authentic. The lady that served our table initially looked very cold and scary but she was in fact very funny and at times, comedic. Great evening was had by all! Seafood Pajeon - A korean pancake, my all time favourite dish of the evening. So crisp and light but not too greasy. Jokbal - Korean marinated Ham hock, comes with a sauce and lettuce to wrap it in. They left the bone and cartilage intact so that the pork lovers can eat the meat off the bone. Nothing wasted. The appetisers that they serve, before the main food comes, were all so refreshing and definitely opens up your appetite to have more. There is a good combination of spicy, sweet, salty and sour in the dishes so something for everyone. Trying authentic kimchi for the first time was also quite exciting! We also had broth soups that are very similar to our chinese broth soups, packed full of goodness and a nice kick. This was also my first time trying out korean BBQ, there are switches on the side for you to alter the heat and the waiter would help you in cutting the meats in to bite sized pieces for everyone - so SO tasty. In fact, I'm salivating just thinking about it. You will notice that I have included a photo of a glass bottle of sprite, which is something we lack in the UK now - every soft drink is in plastic bottle forms. Maybe it was me being in a holiday mood but it definitely tasted better from the glass bottle. Portugese tarts were introduced to Hong Kong in the 1940's through the portuguese colony of Macau and have remained very popular in HK. You can get them at almost any bakery in HK. Came here to have a quick lunch before setting out and surprisingly they were pretty good. They were very busy so we ended up sharing a table with a couple of guys, which isn't a rare occurrence in HK. If you like having a table to yourself when eating out then you may not want to venture in to the small busy eateries. Fish slice noodles and broth. Aubergine stir fried with salted fish and minced pork on rice - very flavourful and the aubergines were perfectly cooked. Beek Brisket Curry - Not too spicy but still a nice kick. Would have loved some roti or naan to go with it instead of rice. This is a chain restaurant that specialises in roasted meat dishes and for a chain restaurant, this branch is doing a pretty good job of it. They always have people waiting to be seated so if you want to give it a go but don't want to wait for a table, make sure to go on non peak times and avoid weekends at all costs! There is a combo rice that allows you to choose 3 different types of meat - I went for crispy roast pork, soya sauce chicken and char sui with rice. All of it was perfectly done but I did find that single stem of choi sum a tad pointless - I suppose they needed some colour on that plate. 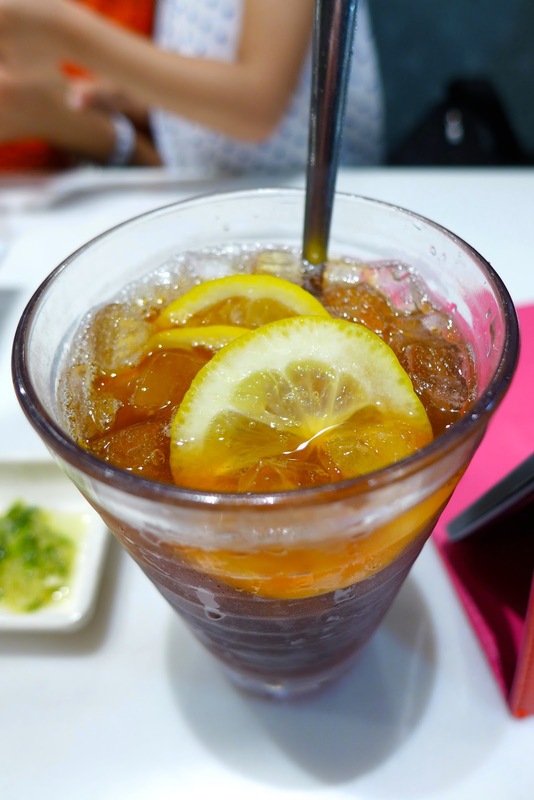 Iced Lemon Tea - I lived on this in HK! We took a walk along The Avenue of Stars, which wasn't really the attraction for me, in fact it was the view of Hong Kong Island across the water and that beautiful sunset! As we took a leisurely stroll, we could smell something grilling from the little stall up ahead. The smell was too distinctive to forget - it was the smell of grilled cuttlefish! It is slightly more expensive than the ones you can get elsewhere but the place is a tourist trap, what did you expect? They also cut it in to strips for you so it is easier to eat on the go. Yes there are protests in the area but luckily this restaurant was a block down from where the troubles started after our meal, so we had it quite peaceful. If you want to try traditional clay pot rice, this is the place! Honestly, the crust that forms at the bottom of the pot is the pièce de résistance! Don't be afraid to order extra dishes as they are quite small, but for me that's the great thing about it because we can sample more dishes this way. Seafood, with my all time favourite combo, egg and tomato. So after the totally awesome dinner, we were taken to have dessert. Asian desserts are normally pretty good because of all the mango and coconut they use (yum!) but unfortunately this time around the desserts side has somewhat let me down. Shame! Mango and coconut cheung fun - The mangoes were so ripe and tasted so beautiful! My only gripe with this is that they could have done without the cream inside. The UHT style cream just made it taste a tad funky and heavy. Mango and coconut "pancake" - again, cream was the spoiler but other than that it was pretty nice. Mango, pomelo and coconut sago aka yeung jee gum lo - Just not as good as Mum's version.